An exciting new culinary chapter has opened for Tintswalo Lodges this year, with the appointment of Guy Clark (36) as Executive Chef at Tintswalo Atlantic in Cape Town. Clark only recently returned to his hometown, having honed his skills in India and Florida (USA) for the past four years. He takes over from Jeantelle van Staden, who remains with Tintswalo in her new role as Food & Beverage Manager. Guy Clark will introduce an innovative new approach to the cuisine at Tintswalo Atlantic, and is aiming to cater not only for hotel guests, but to make it the go-to restaurant for Capetonians:”I would like to offer diners a new perspective on food and a unique taste experience, with dishes that are simple yet sophisticated, and beautifully presented,” he explains. Growing up in Cape Town, Guy Clark’s culinary career took a different path to that of many other chefs. Entirely self-taught, he had a passion for cooking from a young age, but only considered taking it up professionally at the age of 30, when he competed in the first season of MasterChef South Africa in 2012 – and ended up finishing in the top 11. It gave him the motivation he needed to quit his day job at an auctioneer company and follow his dreams. After a stint as a chef at the Madame Zingara restaurant group in Cape Town, he decided to spread his wings and travel the globe, defining his style while learning from masters of the trade. His travels first took him to India, where he spent a year re-designing and running the family kitchens of billionaire businessman Analjit Singh – now the owner of Leeu Collection in Franschhoek. He was subsequently appointed to launch European/African fusion restaurant Uzuri in New Delhi in July 2013. In 2014 he moved to Miami, Florida, first working as Executive Sous Chef at high-end seafood restaurant Seaspice, and then as Executive Sous Chef at the Artisan kosher bakery Zak the Baker. In 2015 he won episode 11 of the Food Network’s popular ‘Cutthroat Kitchen’ TV show (season 8) in Los Angeles. That same year also saw him take on the role of Culinary Consultant at the Marriott Biscayne Bay Hotel. In 2016, Clark decided it was time to head back home to the Western Cape. Testing the water, he teamed up with fellow MasterChef contestant, Samantha Nolan, to set up 1693, a pop-up restaurant at Bellingham Homestead in Franschhoek. The success of the pop-up encouraged him to look for a long-term position, which would enable him to head up and grow a talented kitchen team. He subsequently joined Tintswalo Atlantic as Executive Chef in 2017. Clark’s eight-course “Ocean & Ash” tasting menu for Tintswalo Atlantic that ran from 2017 until early this year, was based on different “themes’” whereby he cited local ingredients and foraging as important components of the process. Unusual plating and presentation styles also played an important part in the dining experience. The first course included three variations of one of his new favourites, seaweed – a natural choice, seeing that it is available in abundance right on the restaurant doorstep. The subsequent three courses carried“smoke” as a central theme—diners experienced innovative creations including Springbok, snoek and pistachio ash balls and Rooibos smoked kudu with wild garlic smoked ‘skattie’ cheese and ocean water cured egg yolk, presented over burnt wild garlic ash—which was then also used for the fourth dish, Liquid umami. The fifth course of Atlantic line fish, burnt lemon rind, scallop and seaweed velouté paid homage to Tintswalo Atlantic’s breathtaking seaside location and Cape Town’s reputation as a glorious seafood dining destination. That was followed by another local theme, “Fynbos”—Fynbos rabbit was wrapped in a fermented goat’s cheese ash case and served with wild sorrel butter. The final main course comprised unique textures of six different mushrooms, including shimeji, king oyster and shitake. “Buchu”, consisted of Buchu ice cream, ash meringue and ocean salt itakuja valrhona chocolate, which completed the taste sensation on a sweet note. Of course, “Ocean & Ash” has a poignant resonance for Tintswalo Atlantic, which came back from the ashes in 2015 following the devastating veld fire earlier that year. Completely rebuilt, the lodge now boasts an even more spectacular dining room as a result—as well as a beautiful wooden deck with unlimited sea views. 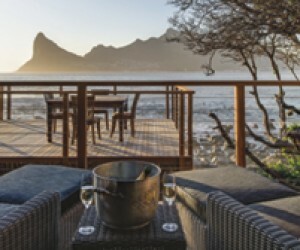 The lodge is one of only a handful of places in Cape Town where guests are able to engage all the senses as part of a unique culinary experience, dining close to the ocean, listening to the crashing waves below and breathing in the fresh sea air. It is also the perfect setting for a pre-dinner sundowner while watching the sun set. The open-plan kitchen inside meanwhile enables diners to enjoy an interactive dining experience, watching Chef Clark and his team up-close at work. The restaurant at Tintswalo Atlantic is the perfect setting for a gourmet experience with a difference, and to celebrate a special occasion. It is open to both in-house hotel guests, as well as other diners by prior arrangement and subject to availability, with breakfast, lunch and dinner served daily. This winter, SA residents can take advantage of Tintswalo Atlantic’s special ‘Winter Warmer’ package, valid until 31st August 2018. The overnight offer includes a light welcome lunch and a bottle of wine, accommodation in a Luxury Isand Suite, a full breakfast as well as airport transfers and a shuttle to the V&A Waterfront at R7 060 for two people sharing per night (two-night minimum stay over weekends).